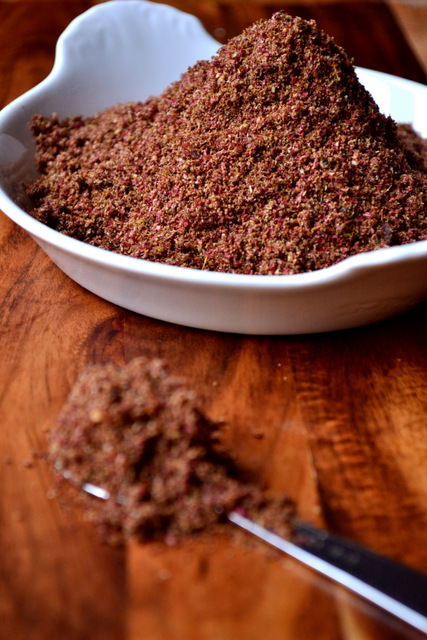 Za’atar is a blend of spices immensely important and popular in Middle Eastern Cuisine. Though there is not one bonafide recipe, za’atar is generally composed of a combination of dried thyme, oregano and marjoram, along with toasted sesame seeds and salt. In addition to these staples, one or more fresh herbs may be added – mint, for instance – as well as cumin and sumac. Unfortunately, like most spice blends, za’atar is only sparsely stocked by supermarkets and even delicatessens and is a little pricey where it can be found. What better excuse than to make your own? It is, after all, the work of a moment. 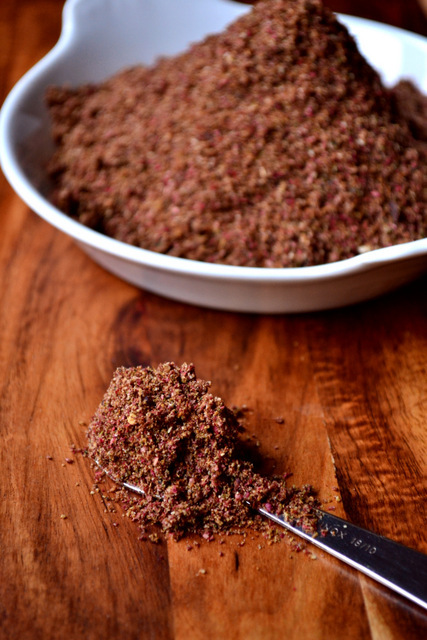 Spice blends tend to lend themselves to all sorts of different applications and za’atar is no different. Impressively versatile, this punchy spice blend is divine sprinkled over labneh, mixed with olive oil and used to dress a salad, or rubbed generously into a joint of meat. Indeed, with so many robust and fragrant herbs thrown into the mix, za’atar has the capacity to make flavoursome all it touches. 1. 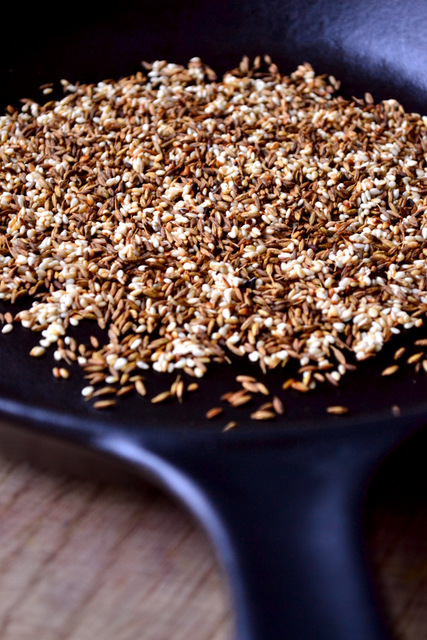 Lightly toast your cumin and sesame seeds in a heavy based frying pan. Tip all of the ingredients into a pestle and mortar or spice blender and work into a fine powder. 2. Store in a jar or airtight container for up to 2 weeks. Cost: If you buy your spices and dried herbs in bulk, which you should, then this blend of za’atar can be made for very little money. Indeed, considering how far this stuff goes 80p for a small jar is fairly reasonable. How great to make it. I haven’t tried that but at the moment have some I bought in Ottolenghi and I sprinkle it on lots of things. That’s the great thing about za’atar, you can literally sprinkle it on anything. Thanks for picking up on this – my za’atar actually does contain sumac, but for some reason I left it out of the ingredients list! I actually thought za tar was it’s own spice. Thanks for clearing this up for me! Nope, it’s a lovely blend – there is a specific herb impossible to find in Britain, which is similar to oregano. Very nice indeed. I should try this, i I ever get the chance. You should – very simple and pretty close to the real thing. I can’t see it! Damn Facebook! Absolutely beautiful – my mum makes this up in batches and keeps me supplied…I’m a lucky lady! Thank you! You are lucky indeed! My mom makes her own Zaatar. She only uses thyme, actually zaatar is the word for thyme in Arabic. I never heard of other spices mixed in it, but that can be a great alternative. My mom mixes sesame seeds, thyme, sumac and some salt. It comes out pretty potent and I can see if someone is not used to it, it can be a bit of a kick, but OH SO GOOD! It is awesome with soft cheeses, that have a subdued taste in nature. We also sprinkle it on Man’oucheh (Lebanese version of breakfast pizza) whether on its own with some olive oil, or with cheese. We serve it with a bunch of vegetables: tomatoes, cucumber, onions, olives, peppers… Good stuff! I’ve seen quite a few different varieties and have developed a blend I prefer. It’s definitely potent! Great to hear that you use it so much – it is a very versatile ingredient! I love lengthy comments – I know it lasts for two weeks, but I guess I meant at its best. Just found some za’atar at my local fruit & veg shop today. I mixed it into Greek yogurt with some olive oil to make a nice quick sauce/dip for falafel. That’s good news – it’s such a fantastic spice mix! Sounds delicious. i adore it.used to use it a lot during my stay in Istanbul. Definitely one of my favourite spice blends.